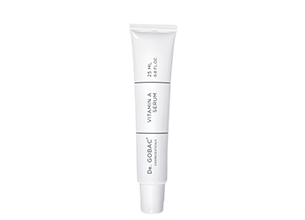 Dr. Gobac Vitamin A Serum is specifically formulated to remobilise the skin’s own healing mechanism. Retinyl Palmitate, a precursor of Vitamin A, controls and stimulates the growth, migration and adhesion of epidermal cells, and protects skin against infections. It is photostable and therefore won’t cause irritation to skin exposed to sunlight. Bioidentical lipids found in Babasu seed, Avocado, Jojoba and Acai tree oils create a protective lipid layer and assist in restoring the skin’s acid mantle. Wild mango protects and repairs the skin through its film-forming activity, thereby restoring softness and suppleness. The anti-oxidant properties of marula seed oil assist in protecting cell walls, while moisturising. This product is ideal for use after the age of 35, or for specifically targeting sun damage and/or pigmentation. Availability: Edgars stores, Placecol outlets and selected salons and spas. To my routine I’ve started adding the range’s Vitamin A serum which is suppose to “re-mobilise my skins own healing properties”. It contains wild mango and marula seed oil and again – has almost no scent to it . I found the Vitamin A serum very sticky and heavy. I didn’t enjoy using it at all and the packaging advises waiting 10-15 minutes for it to be absorbed properly before moisturising. I don’t have 10-15 minutes usually, so this is a bit of an irritation. But overall, once the moisturiser is applied over the Vitamin A serum, you don’t feel the heaviness as much. I can’t promise to use the serum religiously every day – the heaviness is not pleasant. I do however use it as a twice weekly treatment on areas of my face where I know there has been sun damage or is showing signs of pigmentation. I used the Dr.Gobac vitamin A serum for 2 weeks now, and the results is already visible, my face is more smooth and the fine lines are less visible! This is a very good product!